Protection Island. Image courtesy of NOAA. 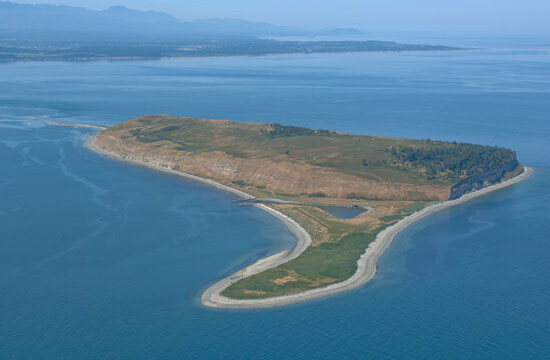 Protection Island became a National Wildlife Refuge on October 15, 1982. 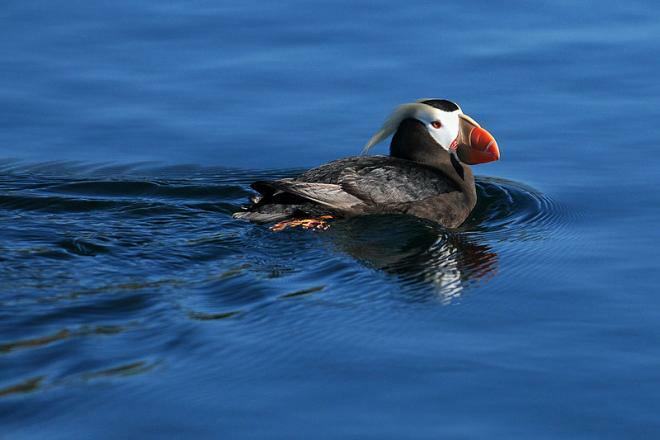 The 370-acre island, located in the Strait of Juan de Fuca at the mouth of Discovery Bay, hosts 72% of the nesting seabirds in Puget Sound, including an estimated 36,000 pairs of rhinoceros auklets. Around 1000 harbor seals use the island, as does one of the last remaining nesting colonies of tufted puffins in the region. The island is closed to the public, although boat tours regularly pass nearby for wildlife viewing. The Washington Department of Fish and Wildlife manages the 48-acre Zella M. Schultz Seabird Sanctuary, located on the west end of the island. A team of researchers from the Washington Department of Fish and Wildlife, the University of Washington, University of Puget Sound and NOAA are currently conducting burrow surveys to determine reproductive success of the island’s population of rhinoceros auklets. Scientists are also studying the auklets’ diet. More than 95% of the North American rhinoceros auklet population breeds in Washington, British Columbia, and southern Alaska, and the Protection Island colony is one of the largest. Nesting seabirds require habitat free of predators and human disturbance. Auklets nest in burrows, so they will only colonize areas with suitable soil types. During the breeding season (March to late September), birds remain close to the colony, but they range widely throughout the rest of the year. The birds are relatively long-lived, with low productivity, which makes nesting habitat a primary concern in maintaining the health of the population. Black-tailed deer, first recorded on the island in 1991, are native to the region but can damage burrows by trampling or bedding down on the burrow entrance. Recent estimates place the population at around 70 deer, which represents fairly high density for the size of the island. Aircraft and boat disturbance is also a concern. Cormorants, which also nest on the island, will abandon their nests if disrupted. The Fish and Wildlife Service enforces a 200-yard buffer around the island. Island habitat consists of steep bluffs surrounding a plateau. Sediment deposits have created two long sand and gravel spits, one on the southwest side of the island and one on the southeast. On the plateau, grassland dominates, but there is also a small amount of mixed conifer forest, including Pacific madrona, shore pine, grand fir, and Douglas maple. Farming, grazing, and development, beginning with early settlement in the 1800s, introduced many exotic species, and surveys in 2008 found only 41 percent of transects populated by native species. In the mid-1900s, at least two major fires burned a large percentage of the island, reducing the amount of forest and changing the composition. Eleanor Stopps, a Jefferson County resident and activist, is famous for her work to preserve habitat on Protection Island, which was threatened by development in the 1960s. Stopps raised $50,000 to buy lots on the island and lobbied for support from locals and national conservation organizations. The Nature Conservancy gave her its highest award, the Oak Leaf, in 1992.